The excitement and stress leading up to the National and then the sigh of relief as you fly home, only to realize the actual National is only a buzz in your memory. My feet and back hurt. Not really a complaint. Sure, floors are solid concrete and we spend countless hours on our feet but its over now. The show was great, better than I imagined. I will try to post a recap later this week. I did do another plane sketch on the way to Cleveland this morning. 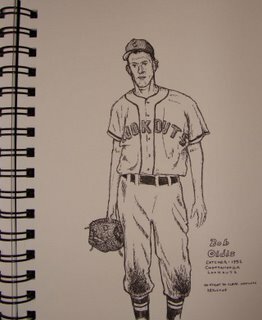 This one is of Bob Oldis. Former catcher for the Chattanooga Lookouts nad the Washington Senators. 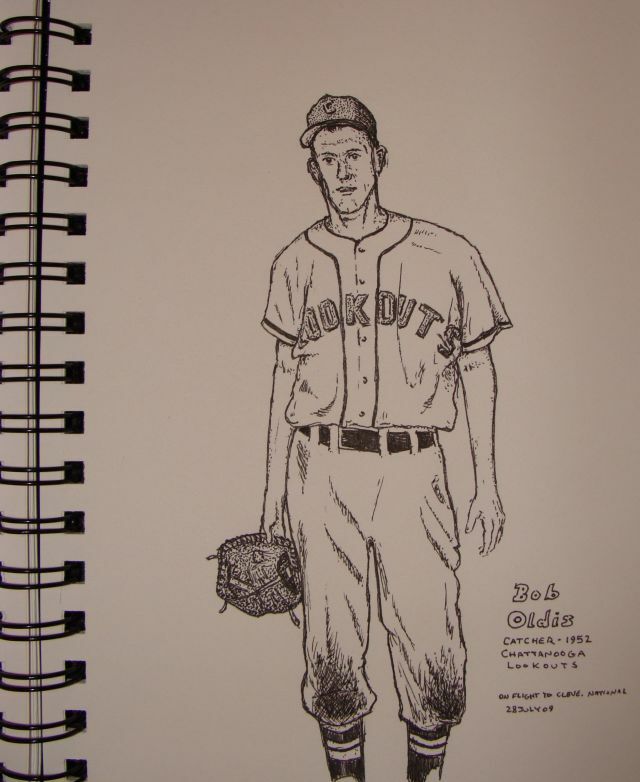 This sketch is from a photo of Bob while playing for the 1952 championship Lookouts. It was taken in Ponce De Leon park in Atlanta. Trying out a different format for sketches. This card is the standard 2.5" x 3.5". The next few sketch cards will be card tributes and hope they get better as they go along. Any ideas or requests? We are packing our bags for Cleveland, OH for this year’s National. Only a few days left! While the grading team is well versed in traveling to shows around the country, the National is unique. This is the only show where we will slab cards on site. This means all the sealing equipment and computers and other assorted hardware has to be crated up and shipped out. As usual, the booth will be hopping with craziness, cards and excitement. Sketch card Brian Kong will be set up at our booth this year displaying his fantastic art. Even if you cannot get one of his sweet sketch cards, come by and get your 2009 Topps Allen & Ginter cards signed by him. Brian is a great guy and loves to talk about his sports art and sketch cards in general. Sitting in the grading area and seeing amazing cards throughout the show is as you can imagine awesome but I also enjoy meeting fellow collectors and BGS fans. If you have a grading question, come by and see us. If you just want to meet some of the BGS gang and say hi, stop by! Grading at the National means late nights under the loupe but I will be posting updates at the show here and on Twitter. Hopefully there will be some great photos and sketches to share with everyone! The 50th Philly Non-Sport show is here! I just arrived in Allentown this afternoon. Tomorrow is the 50th Philly Non-Sport show and I will be there at the Beckett Grading booth. This is BGS's first appearance at this long running show so we are excited. If you are a fan of non-sports cards and are in the Allentown area, come by the show! BGS will have exclusive pricing available only at the show. If you were ever thinking about submitting cards for grading this is a great chance to try it out, and save some money. The 50th Philly Non-Sport Card show is May 2nd and 3rd, 2009 in Allentown, PA.
Beckett Grading decided that it is time for a presence at this show so I am off May 1st to Allentown. 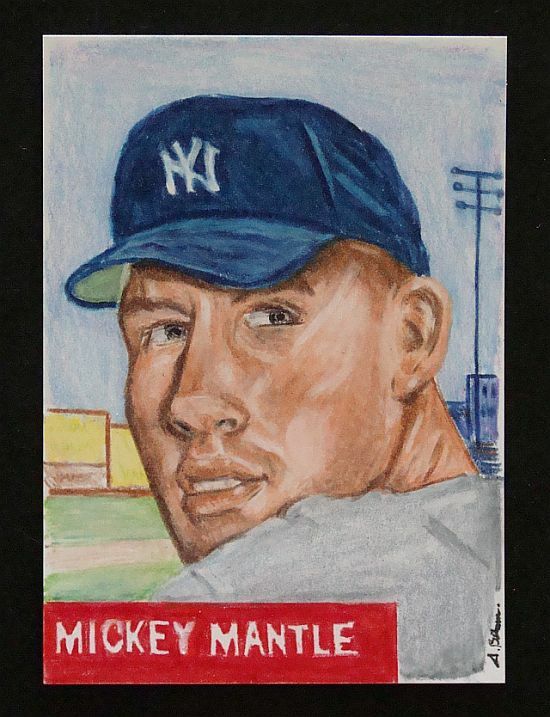 I am a fan of sketch cards, especially sports sketch cards. I like collecting them and love making them. I believe sketch cards are growing in popularity and will be as popular as sketch cards in non-sports sets in the near future. Sports sketch cards, really all sketch cards are still a relatively new phenomenon in the hobby. There are some great ways to improve sketch cards that I hope will be coming down the pike soon. For me, this will be a fun show. The combination of non-sports cards and the Phillies AAA team less than 2 miles from my hotel makes for a fun weekend. If you are interested in submitting cards under the show-only special pricing, or just want to come by and chat, drop me a line! Easter Sunday around here was, for the most part, somewhat quiet. We did all of our "stuff" on Saturday because of the T-storms that were coming in on Sunday. I was going through the collection and I ran across my Bert Niehoff signed photo. I remembered I have been meaning to add him to the sketchbook for some time. I knew one of these plane trips soon I would lug him along and add him. 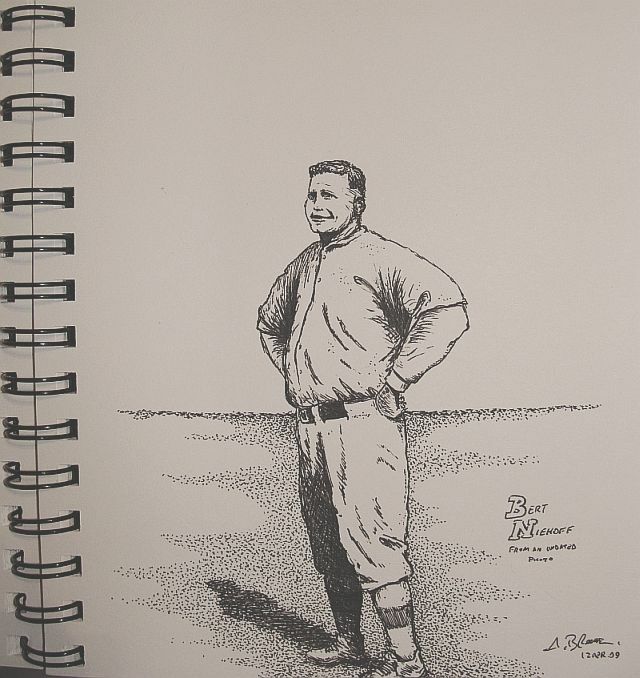 Bert was the Lookouts manager, among other things. 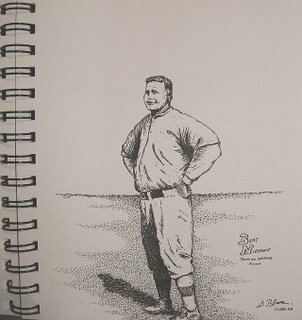 He also won a World Series in 1915, as a player. Anyway, here is the sketch. We are heading to the Frisco Roughriders game this Saturday. We bought special tickets that are part of a charity. We get food, drink and hats! Of course, we will be getting autographs as well. Will post the signings on Sunday. I am the Senior Vintage Grader with Beckett Grading Services. (BGS) I am also the author of the novella "Her Curves Were Too Much For Them."